So, take a really really good look at this picture. Go ahead. Really study it. This is a random picture I found in my husbands baby book. Why was it in the baby book nestled amongst the cute infant photos? I have no earthy idea. But once I started to look at it, I just couldn't STOP looking at it. It intrigues me. Some of the people in the photo are known, the man in the background arms a-kimbo is my husband's grandpa, the man smoking he thought was his dad but alas his dad is a non smoker. It almost caused a family scandal, but after some research we come to find out it's just an uncle -oh and his mom is the woman behind him with her arms crossed. 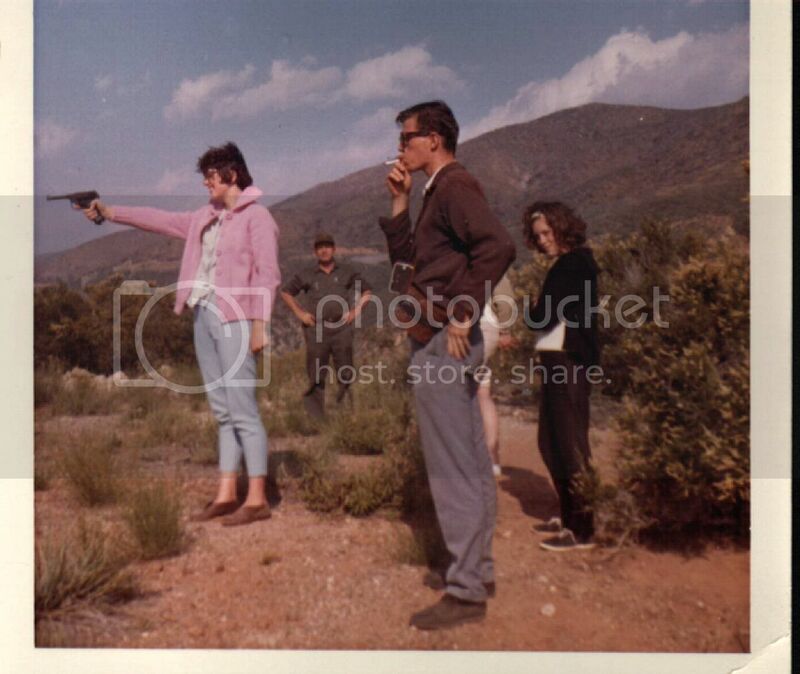 Only trouble is, after much speculation, no one can remember when or WHY this picture happened, but more importantly, WHO in the heck was the gleeful, crazed looking woman with the gun?? What was she shooting at? Why does she look so happy? Why did she dress like that to go shoot guns in the wilderness? Did she escape from an asylum? Why is grandpa staring down the camera and not watching the action? I just can't stop staring at this picture. I stare at it until I start to laugh. I think someone could make up an entire movie plot from this one picture, it's just so rich with unanswered questions. They say a picture is worth 1000 words, but you'd have to at least double it to get your money's worth on this one. If you can't stop staring at this picture either and can come up with a clever caption or back story, feel free to share it with the rest of the class. Actually, it looks like grandpa was out there getting a picture taken in the nice scenery, and just before the camera shutter opened, all of these random people dropped into the scene. The Great State of Nevada, The Silver State, home of legal gambling, legal prostitution, quicky marriages and quicker divorces has broken new ground today in the fight for women's equality. With the sexual revolution raging around them, Nevada lawmakers announced today that they will officially legalize 'Husband Hunting' in an bid to increase tourism among the non-gambling public. Although not technically a spectator sport, Mr. Elder believes that most young ladies will give a nod to tradition by taking their parents and older brothers along on their hunting trip. “America is a land steeped in traditions” said Mr. Elder, “traditions we will not abandon willy-nilly as our civilization advances. We expect this sport will find a balance-point where Dad and older brother come along to help dress the kill and Mom and any other siblings will meet them at the nearest Wedding Chapel to complete the tagging process”. The Husband Hunting License will be sold at all Nevada Courthouses as well as at sporting goods stores across the state. A two-week license kit for a non-resident will cost $150.00 and include the license, a husband tag (a small gold band which will be fitted to the kill's left ring-finger by either a member of the clergy or a Justice of the Peace) and a certificate redeemable at any of Nevada's wedding chapels to have the tagging completed in accordance with state law. “Mr. Right” while her father, brother & sister look on and offer helpful advice.